Polenta is one of my very favorite things on Earth. It amplifies so many dishes. I love to use my Basic Cheesy Polenta as a base for sausages and peppers, or for a classic red meat sauce. 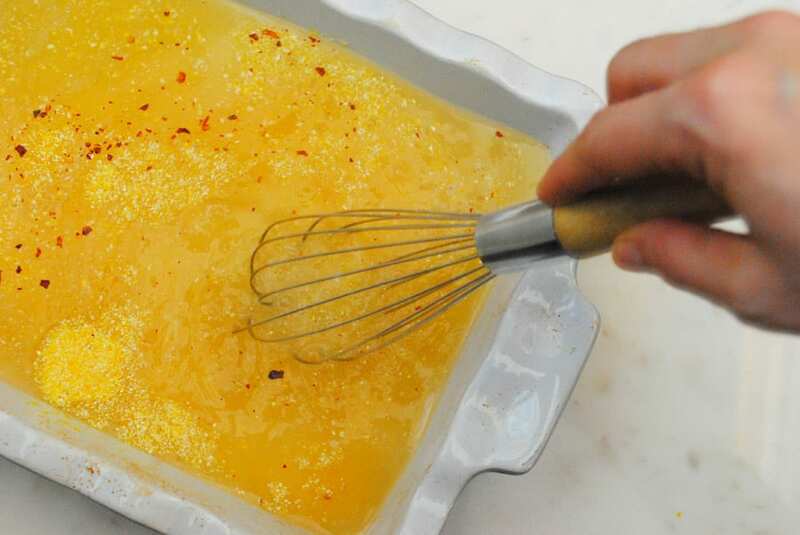 But my ultimate favorite is as the base for a delicious runny egg yolk. 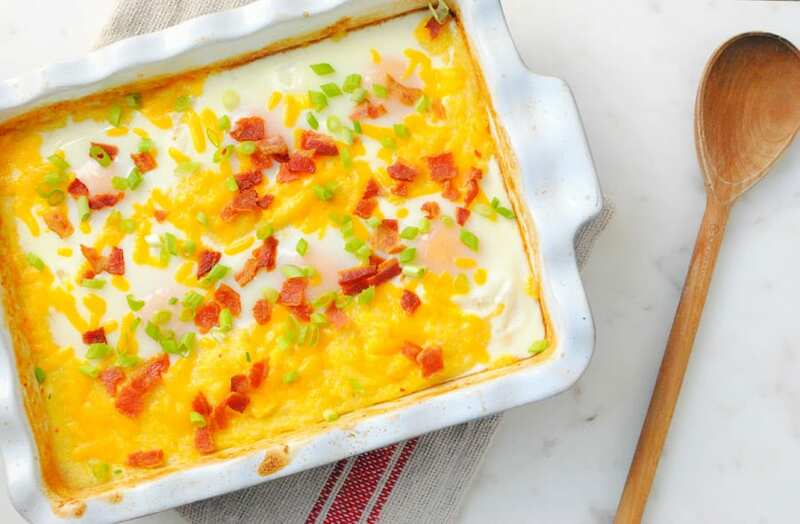 And so this Polenta Breakfast Bake was created. I became intrigued with the idea of baking polenta in the oven. Let’s be honest my idea of making breakfast does not in any way shape or form, involve me standing at a stove stirring. It almost always involves me putting something in the oven and then enjoying a cup of coffee and waking up while my oven does all the work. I know polenta cooks up in literally five minutes, I get it, but again, we’re talking AM not PM. And that is why this makes perfect sense to me. 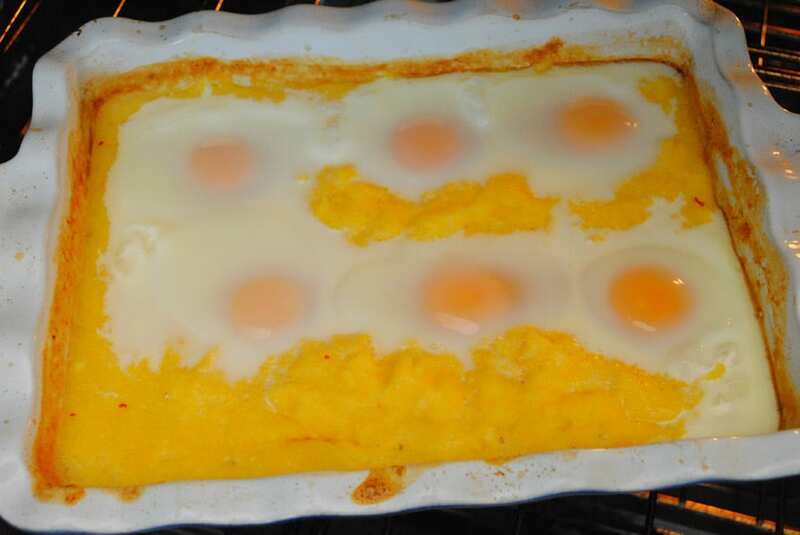 After the polenta bakes up you crack some eggs on top and let those cook in the oven for a little longer. Then top everything with cheese, bacon bits, and green onions of course. I also love sprinkling on Cholula hot sauce as well. You simply scoop out an egg, deliciously creamy polenta, and some delicious toppings and serve. It’s so easy! 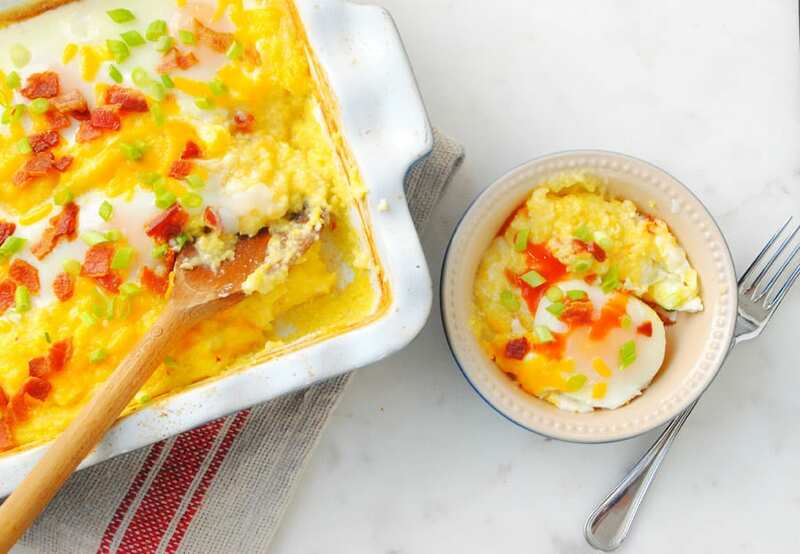 Be prepared to fall in love with this delicious Polenta Breakfast Bake like I have. It’s absolutely beautiful and incredibly delicious. 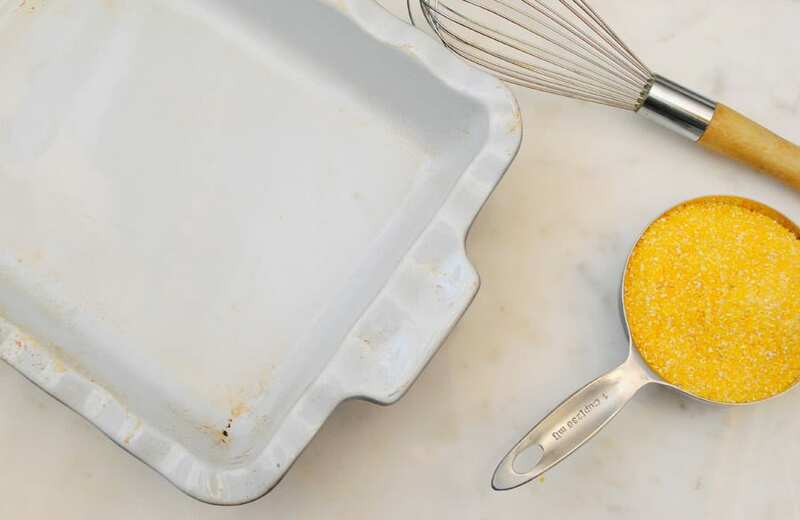 If you haven’t ever tried polenta as a breakfast treat, be prepared to fall hard. 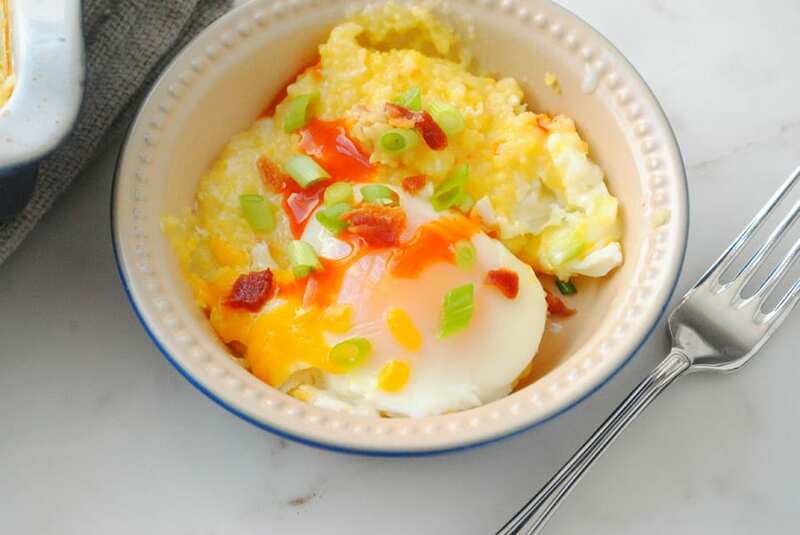 It’s the perfect way to sop up runny egg yolks, crisp bacon, and fresh green onions. Enjoy some coffee and sit back and enjoy your families company while your oven cooks up a delicious savory breakfast for you. In the casserole dish pour in the chicken stock, melted butter, salt, crushed red pepper, half and half, and polenta. Whisk to stir then put into the oven being careful not to spill. Top with the shredded cheese then place back in the oven for 2 more minutes. Pull out of the oven and top with the bacon bits and green onion. Serve warm into bowls with an egg in each. I like to use hot sauce sprinkled on top too.